If you’ve rented in Toronto this winter and spring, the buzz has been about one thing: purpose-built rentals. With developers switching no less than three in-progress buildings originally slated for condos to rental units after a nearly 20-year drought, the concept of the apartment building is undergoing a cautious renaissance. It’s left many renters weighing their options in a market where what matters is what you get for your rent. To help navigate the landscape, here are five solid advantages to renting a Toronto condo. It’s one of the most overlooked—and most time-saving—aspects of condominium life: Instead of hauling that laundry basket down to a laundromat or basement laundry room full of paid machines, all you have to do is open the laundry closet door, start your load, and go about your day. No hoarding quarters or keeping track of a building-issued chip card; no need to set a timer to switch loads or camp out with a book; no showing up after hauling the laundry bag out to find zero free machines. And no running into your Modern Lit professor in the elevator with a basketful of very visible underwear balanced on your knee (true story). The small convenience of ensuite laundry adds up to a lot of saved time and comfort, and if you have a small child, a sick partner, or a flood that uses up every towel in the house, having that washer and dryer in your unit becomes a lifesaver. Climate control isn’t always a given in an apartment rental: to economize, most purpose-built rentals in Toronto were built with a central system, and no thermostat to adjust the heat or cool air in each unit—which is why half the renters you know have a window AC unit, or know where to get one. But with condominium units built for owner occupation, there’s a practical guarantee you’ll have AC during those three muggy weeks in August—and that, amortized into the condo fees, it won’t cost you your whole August paycheque. Common area upkeep is another of the subtle—but crucial—elements of living in a high- or mid-rise building. If the lights in the lobby don’t always work, if the elevators are frequently out of service, if the hallways are never really clean, there’s an impact on your day-to-day life that adds up. Condo buildings, who put that upkeep in the hands of the residents—and fire property management companies that don’t meet those day-to-day standards—have a lot of reasons to be exceptionally conscientious about their state of good repair: any faults or major issues that start with slack upkeep will be showing up on the condo board’s bills—and the people who live there will be the ones putting up with the repair. It’s the most harped-on point when it comes to discussing the condominium decision, but it’s a valid one: Renting in a condo building isn’t just renting your unit, it’s renting a party room, a swimming pool, a workout room, a rooftop space, and more, up to and including meeting rooms, dog wash stations, cinema-style home theatres, rock-climbing walls, and urban gardens. Taking full advantage of the amenities in your building can save you a bucket of money and time compared to searching them out in the city while living in a rental-geared apartment. 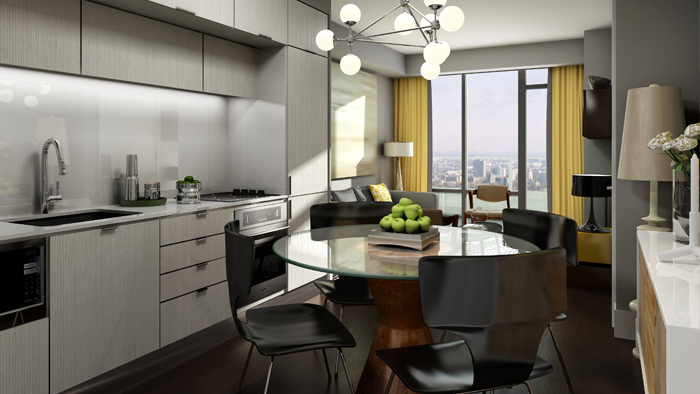 What you save on the commute to the gym alone is worth a second look at condominium living. Good building security is an investment: It means decent pay for the security staff so that desk isn’t a revolving door of uniforms, a good coverage of operating hours, building relationships with the people living in the building, and having a strong awareness of what issues the neighbourhood around the building faces, and how they change. It’s an investment that’s harder to find in purpose-built rental, especially at reasonable price points. With most rental units in the city not having any security presence at all, and many rental buildings opting to confine security to weekends, the 24/7 security that’s just standard in most Toronto condo buildings is a major advantage. Just the act of having someone there can be enough to keep most funny business out, and for a security officer, understanding the building’s daily routine helps spot anything that’s out of place and nip that stuff in the bud. Not to mention that a stable security presence is a great way to keep arguments inside the building from getting too far. A concierge or security officer knocking on your neighbour’s door to ask them to keep it down past midnight is a problem solved—one without noise wars, bad blood, and stress for everyone involved. As ever, everyone’s deal-breakers when it comes to renting their new home are different—and they should be! Weigh the advantages and disadvantages carefully, and if these five factors are important ones for you, a condo rental might be the best way to set up your new home.